Around Zhongshan road, the major shopping and business street in Dalian, there are several shopping complexes. restaurants and skyscrapers. 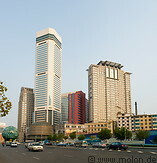 This is the elegant business centre of Dalian with many office building and modern architecture.